It can be found at the southern tip of Koh Samui. Its golden color is beautiful is the sunlight. The entrance is guarded by two ‘Yak’ (Giant). It’s a great place to take a photo to remember because you don’t have anything around it destroying your photos, and the turquoise sea behind the statue just make it even more perfect. 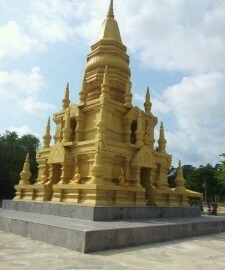 It’s located eleven kilometres south of Lamai.